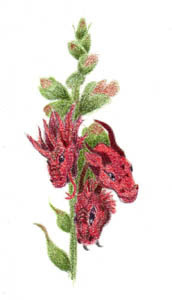 Sherry's Colored Pencil Corner: Illustration Friday - "Snap"
At first I was just going to draw some snapdragons for this topic, and then I started thinking about snap DRAGONS, and the next thing you know...SnapDragons! The line art for the dragons' heads is from Neon Dragon's Art Page, and I have totally not done them justice. There are absolutely lovely coloring pages there. But I digress. SnapDragons is a little bigger than my usual ACEO size, about 2.5" x 4", Prismacolors on Rising Stonehenge white vellum. Thanks to you both for the comments! Thumbnails...here's what I do: open the picture in Photoshop and then save it using "Save for Web" (this makes the file size small). Then I open the saved picture in Paint Shop Pro and use the selection tool to pick out the section for the thumbnail--the measurements at the bottom of the screen show when it's 50x50. Does that help any? Nifty... Botanical yet fantastical. Shows up best big! ooh, I like this one a lot!